I have to admit, while I love trying new cuisines and sampling unique, ethnic flavors—I love me some comfort food! High up on that list of food that makes me feel good is Italian. Whether it’s a big bowl of pasta, a gooey, cheesy pizza, or a delicious fresh cannoli, I have a weakness for the heavy carbfest that comes from most Italian meals. 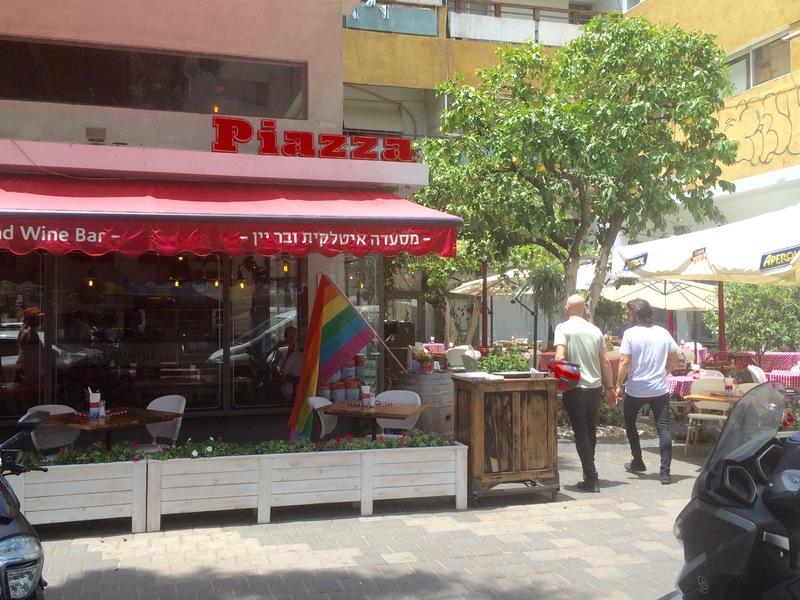 Therefore, it should come as no surprise that Piazza is one of my favorite restaurants in Tel Aviv, and a “must eat at” when I’m by Dizengoff Square. 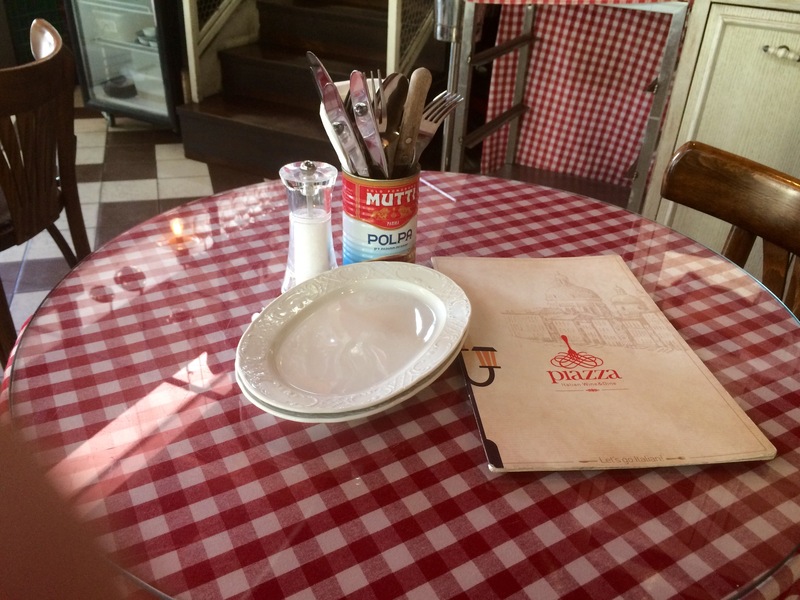 Piazza is aptly named as it has a large outdoor dining area that is modeled after an Italian piazza—in fact there are trees and beautiful lights that only add to the magical trip to Italy that you’re taken on by the food. 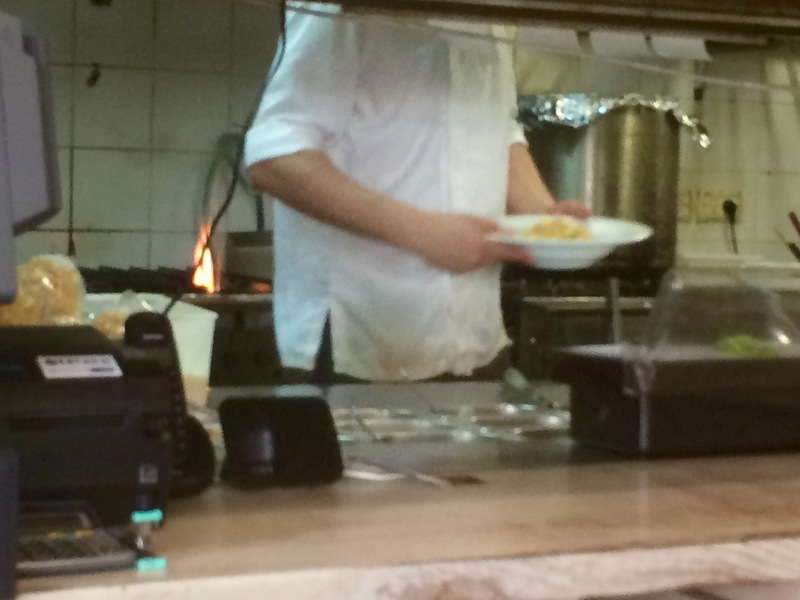 There is also an indoor seating area that is reminiscent of a trattoria or Italian bistro. 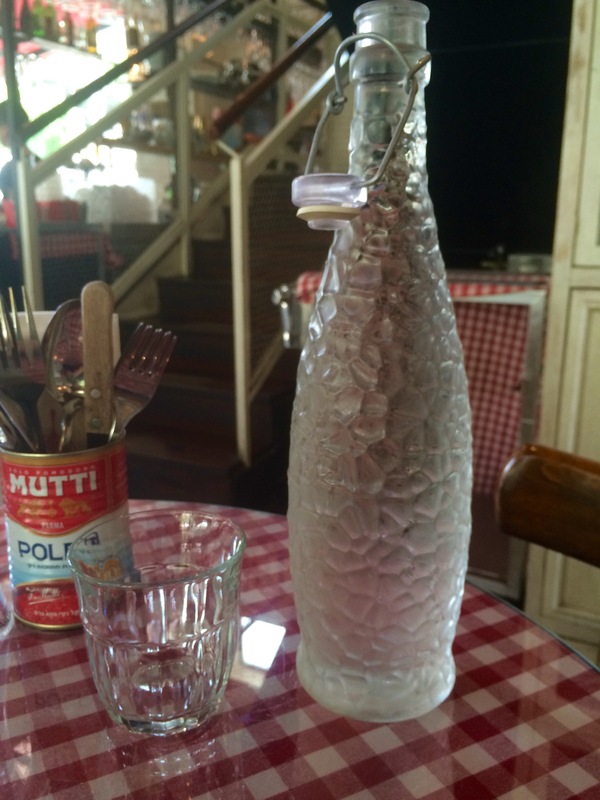 The focal point of the indoor dining space is the large brick oven that has clearly been imported from Italy, as well as the Little Italy style white and red checkered table cloths—very “Lady and the Tramp.” There are English and Hebrew menus available, and the waiter brings a funky-looking bottle of cold tap water to the table as you sit down. Although I didn’t order one on my most recent trip, the Italian soda bar here is tasty and refreshing as well. I’ve eaten here a few times and have tried multiple dishes, but every time I come here I can’t resist ordering the Truffle Pizzetta (34 shekels, ~$9). The pizzetta is in actuality a mini pizza. The pizzetta is baked off in the brick oven so it maintains its crisp edges—even with toppings—as well as a wonderful chewiness only found from expert pizza makers. In fact, the crust reminds me of the one I’d get from a small, brick oven pizzeria in NYC. After it comes out of the oven, the crust is slathered with truffle cream, which is so important to this dish. 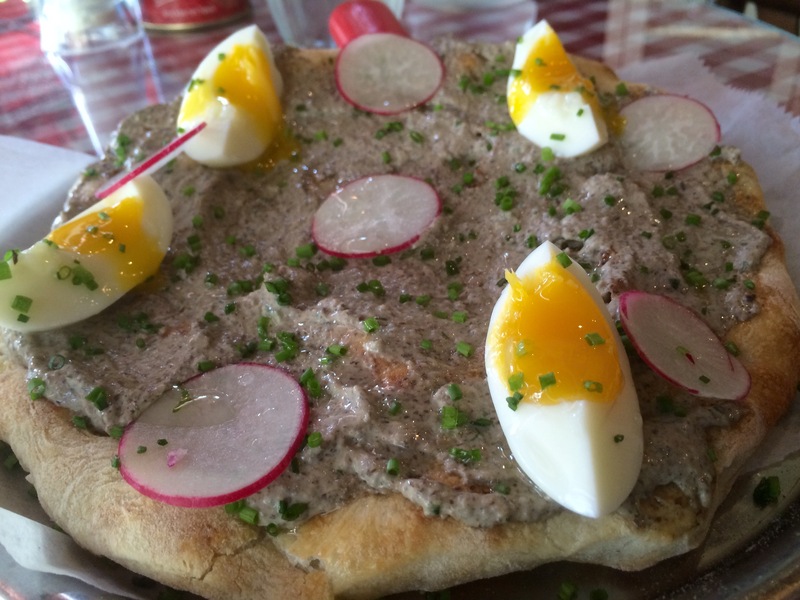 The truffle spread is garlicky, pungent, earthy, creamy and oh so delicious. Then a soft-boiled egg—complete with slightly loose yolk—is cut into quarters and placed onto the pizzetta as well as a few thinly sliced radishes that are spicy and help cut through the richness of the dish. The cold egg and truffle cream atop the hot crust is makes for great temperature play, and the hot crust warms the cream and intensifies its unctuous truffle flavor. In addition, there is wonderful textural contrast between the crisp crust, the creamy egg yolk, velvety softness of the truffle spread, the crunch of the radish and the soft chewy egg white. Honestly, I could eat this everyday and be so happy. The dish is also playful and beautiful to look at. It comes with your own little pizza cutter so you can have it all to yourself—which I usually do—or divide among a few. The dish is garnished with some chives and micro basil before it hits the table, which is a classy touch and adds some freshness to an otherwise heavy starter. For the main dish, I try to switch it up each time I come here. 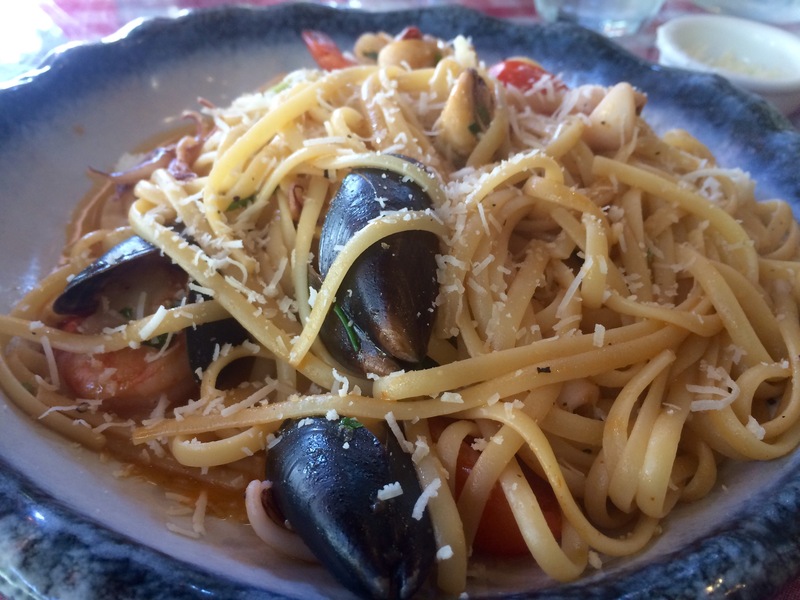 One of my favorite dishes, which is technically a special, but is served somewhat often, is the Seafood Linguine (64 shekels, ~$17.50), composed of shrimp, calamari and mussels in a crab and butter sauce. The shrimp was plump, perfectly cooked and moist, while the calamari was tender and not springy or chewy at all, and while most of the mussels had come out of the shells, they tasted good and looked very pretty and absorbed some of the spicy sauce. The linguine was cooked al dente so not mushy at all, and drank up the wonderful butter based sauce, and coated the noodles. The sauce was made with sweet green basil, rich butter, piquante raw garlic, and cherry tomatoes, which are a national specialty of Israel. In fact, Israel is known for their sweet cherry tomatoes since much of the water used to grow them is from the Dead Sea, which is so salty that it causes the tomatoes to become sweeter than usual—you could taste that sweetness in the dish, especially contrasted with the subtle heat in the sauce. There’s some sliced (almost) raw garlic, which perfumed the dish and enhanced the flavor of the pasta as well. The hot pasta tossed with the sweet tomatoes, some fruity olive oil, creamy butter, raw slivered garlic, earthy basil and plump, meaty seafood was a heavenly combination. This dish is so fresh tasting and the bounty of seafood is perfect for Tel Aviv, since it’s a beach city—makes you feel like you’re at the sea! I’d get a meal like this in a five-star Italian restaurant at home. Delizioso! 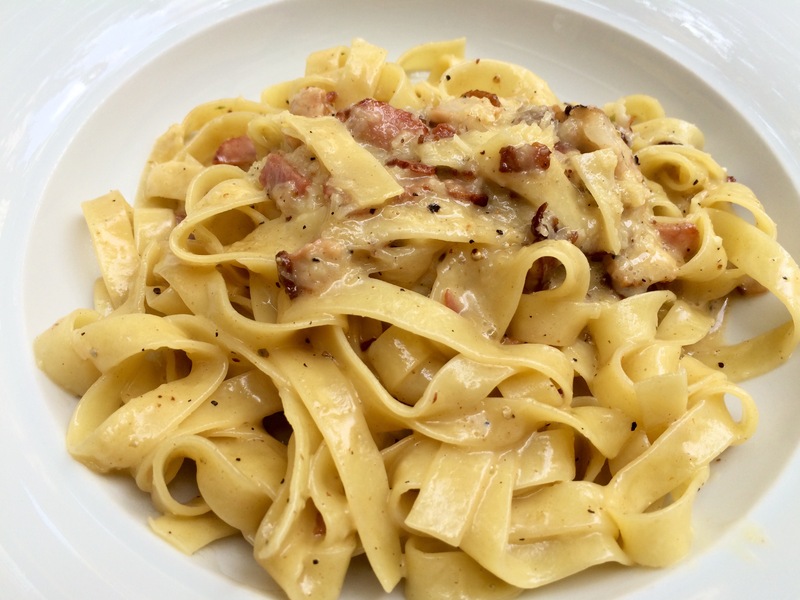 Another great entrée choice is the Tripoline Carbonara (62 shekels, ~$16) or fettuccine carbonara, which I added grilled chicken to (7 shekels, ~$2). The chicken was grilled and had a nice crust develop on the outside of the flesh—probably from using flour in the coating of the chicken before it went into the pan. The result was some very moist meat that went well in the pasta.The fettuccine was cooked nicely and cooked softer than the linguine, but not chewy. 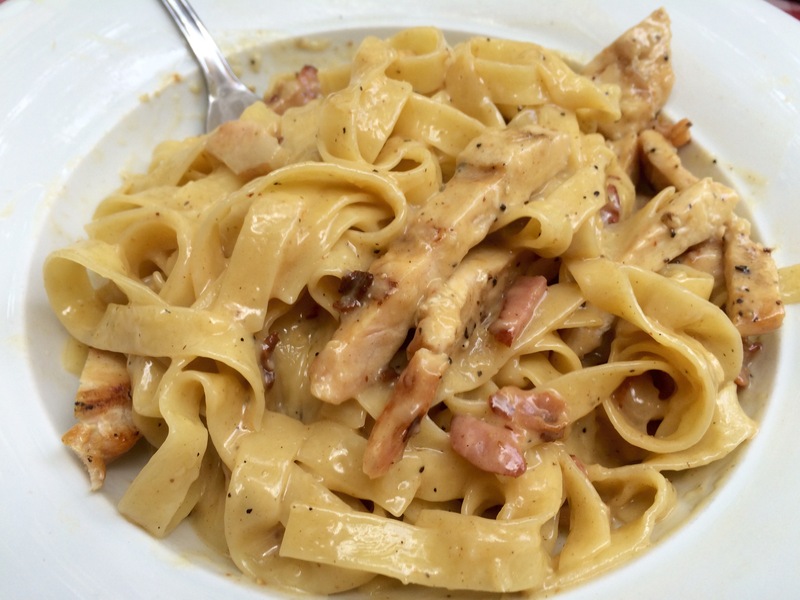 The carbonara sauce clung to the noodles, and was creamy and thick. There was a nice kick of black pepper, and some saltines from the Parmesan and bacon, The bacon itself became soft and almost melted into the dish. 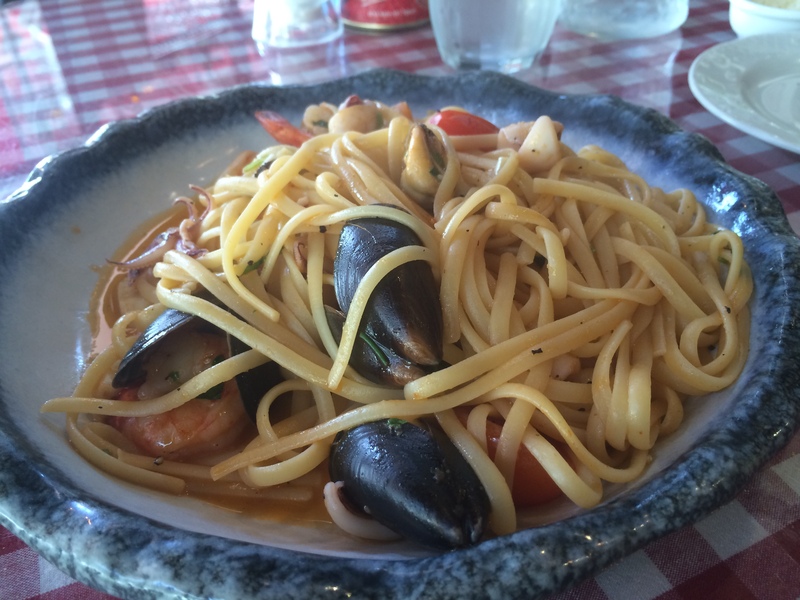 This was a very decadent dish of pasta and very, very comforting. I’m usually so full by the time the waitress asks if I’d like to see the dessert menu, but I made it a point to have dessert on one of my visits here a couple of weeks ago. I’m a big fan of chocolate and was actually eying the appetizing Marscapone and Nutella Pizza, but ended up going with the Creme Brûlée (34 shekels, ~$9). 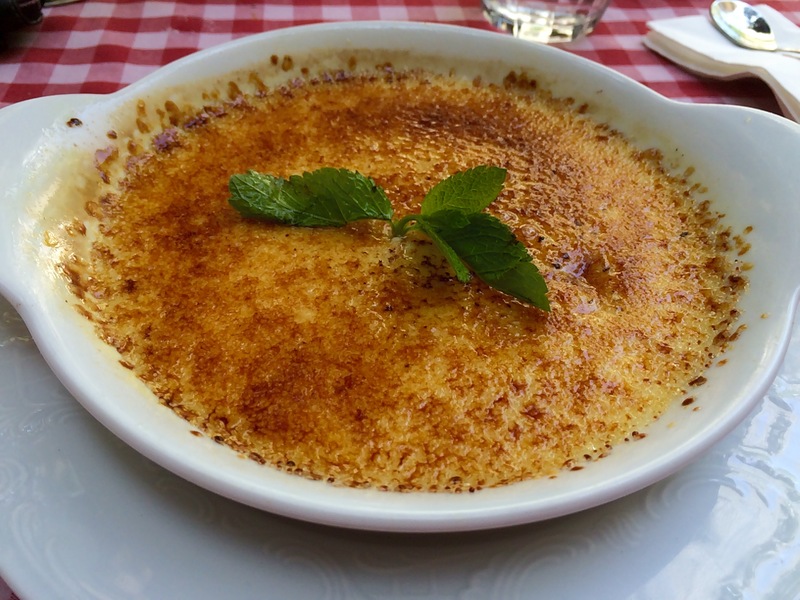 The creme brûlée was cooked in a large, wide ramekin and had a perfectly bruleed top and a thin layer of custard underneath. The top itself was almost like stained glass and I performed the spoon tapping test and it passed with crunchy colors. As I ate this dessert, I sometimes got a little of a charred bitter flavor from the burnt sugar, which was wonderful in contrast to the sweetness of the custard. The custard was sweet, with a strong vanilla flavor, and velvety smooth. It had an almost pudding-like consistency but still very much set. The combination of the crunchy top and the creamy custard was also very playful. The ramekin was garnished with a sprig of mint—a lot of attention to detail was given to the dish’s presentation. Great way to end the meal. The dining experience at Piazza was and is always great. 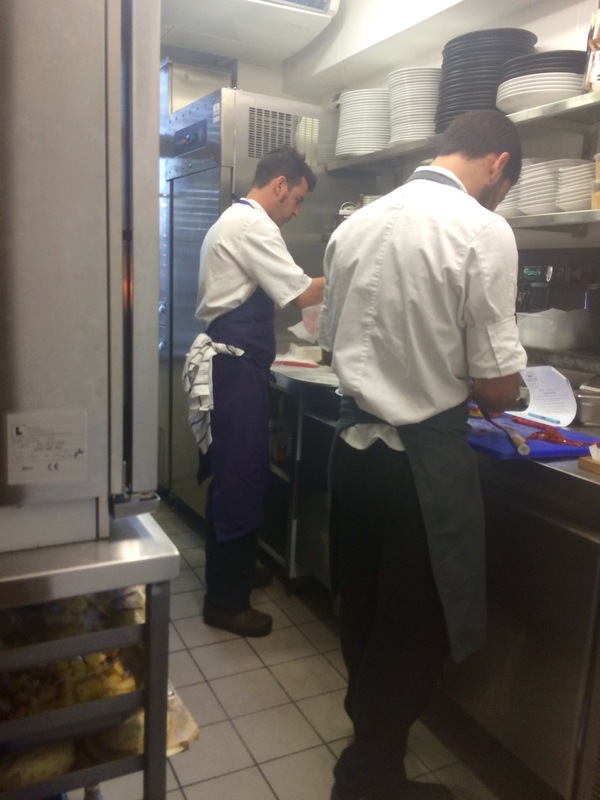 They have special discounted prices at lunchtime, and the service is always friendly and attentive. The food is delicious, and the portions super filling. 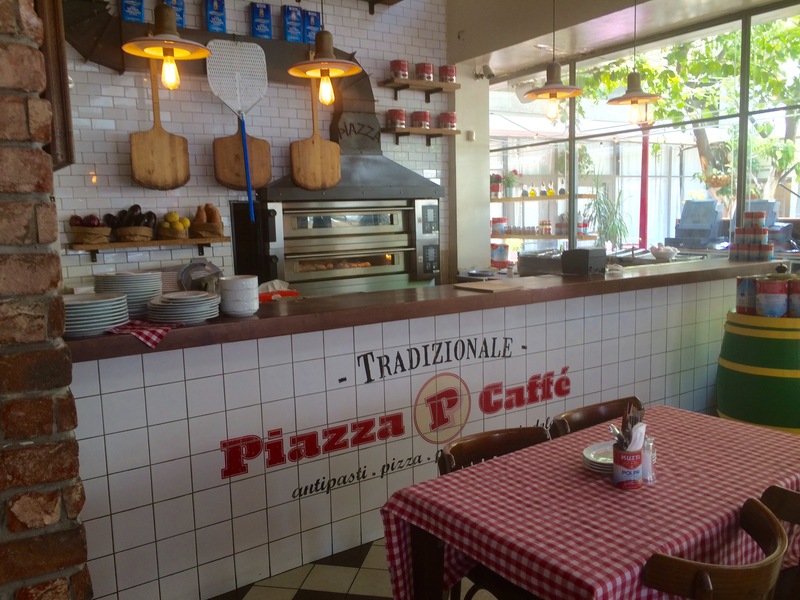 Come eat here when you are in Tel Aviv, you won’t leave disappointed—or hungry! Tel Aviv is, in my opinion, an amazing cit. In some respects, it reminds me of mini-Barcelona with the beach and then a large downtown, and in some respects it reminds me of San Francisco with a slightly bohemian attitude. 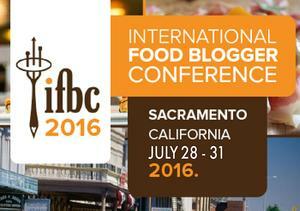 Either way, it has a killer food scene. Continuing on my Israeli food journey, this stop was actually towards the end of my trip. After eating lots of local Israeli delights like hummus, pita, falafel, salads, roasted eggplant etc., I was craving something a bit different, so I decided on Thai food. 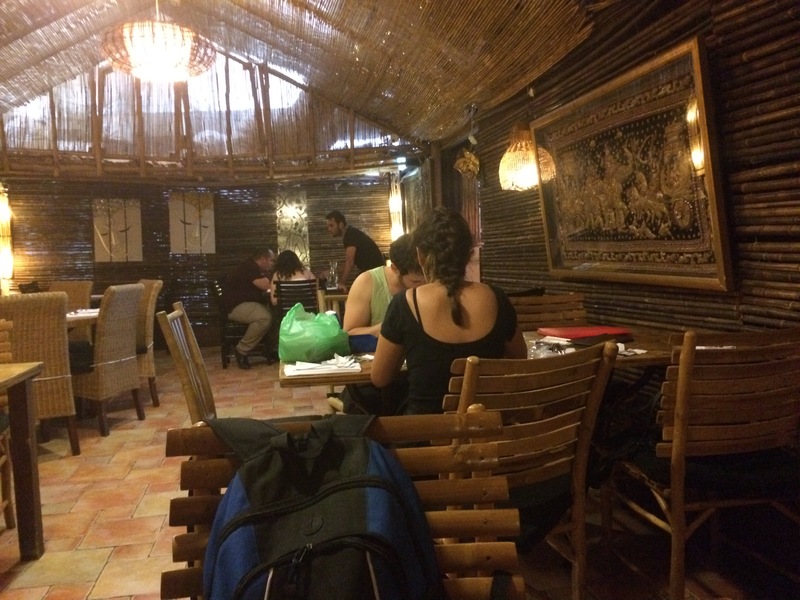 When I asked around, and then looked online, Thai House off of Ben Yehuda Street near the beach was recommended over and over. After having eaten here, I wholeheartedly agree—this was definitely some of the best Thai food I’ve ever had. This place gets super busy around dinner time, and all day on the weekends since it’s a block from the beach. There were a lot of locals eating here, as well as some American tourists in the mood for an authentic Thai meal. I was at one of two tables filled when I came in and the whole room was filled when I got the check. 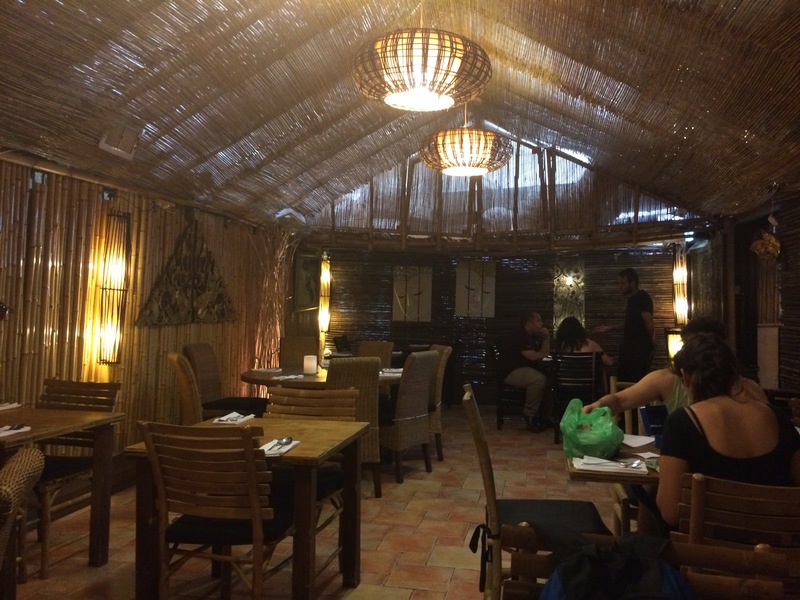 I sat in the dining room that had bamboo walls and roof, and it very much lived up to its name of “Thai house.” The menu was big with lots of choices, and all of the dishes can be made to your spice level. I wish I had 10 stomachs to eat with, especially with the incredible smells emanating from the table next to me—lime citrus, spicy chili, umami fish sauce, sweet Thai basil, garlic, and more—each one more tantalizing than the next. The table decorations were very simple—no frills—and it was clear that the food and authentic decor are the main events here. I do have to say that I regret not trying one of the cocktail specials that sounded refreshing. The best part of my meal here was really the food though. It was hard to choose from all the selections, but I think I chose wisely. 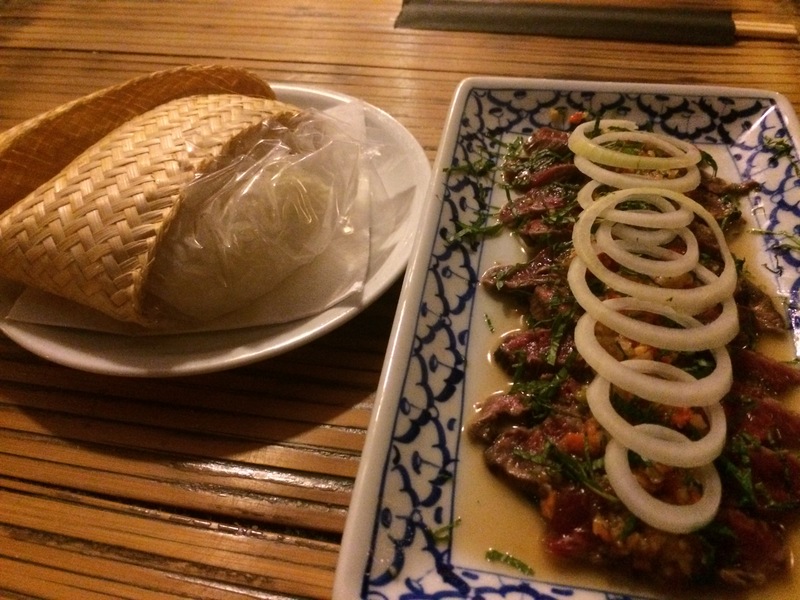 I started with the Yam Neua Beef (46 shekels, ~$12), or grilled rump beef served with a hot chili fish sauce. When the plate came to the table it was presented beautifully. The sticky rice came in its own sack, and I was encouraged to tear pieces of the rice off with my hands and eat it with the spicy beef. The beef was sliced thin and garnished with sliced onion on top, and sliced cucumber below that almost became pickled from the heavily acidic sauce coating the beef. The meat itself was so tender and had been marinated in lime juice, chilis and fish sauce, and some sugar to tenderize the beef. The choice to cook the beef at medium rare also kept it from being chewy. It made it not only super pungent and spicy, but also light and meaty, and the sticky rice was able to absorb excess sauce. The plate was also garnished with small pieces of chili—leftover from the marinade—as well as some mint leaves. The dish was just fun to eat, and the temperature contrast between the warm rice and the cool meat was a nice touch. For my entrée, I wanted some sort of noodle dish and went with the recommendation of the waiter—Yum! 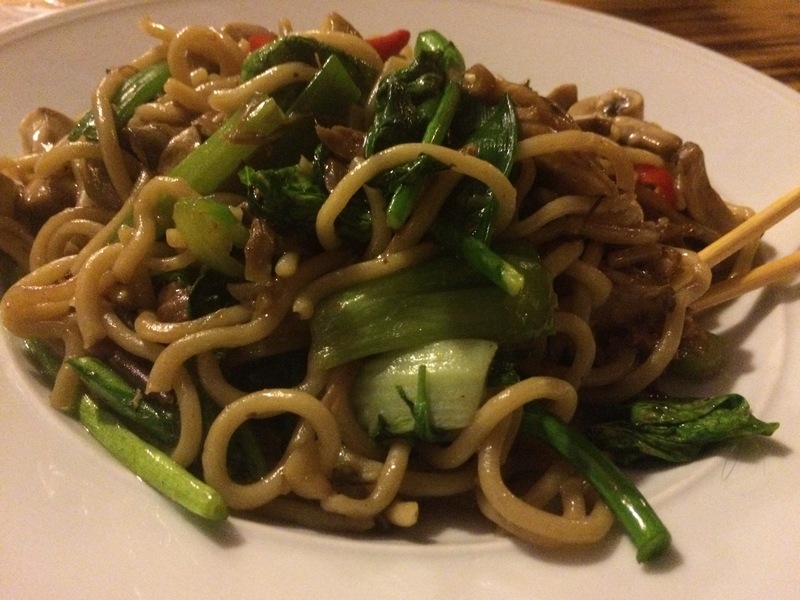 The Pahd Sen Lian with goose (72 shekels, ~$19) had egg noodles that tasted homemade, and not mushy at all, as well as three kinds of mushroom—button, shiitake and oyster—morning glory—sometimes known as Chinese broccoli—and scallions. I requested the dish spicy, which it was, but I also added some pickled chilis to the noodles from the tray of spice condiments that was brought to the table. The result was a building heat that complemented the slightly sweet sauce on the noodles.Although the ingredients were very refined, the presentation and composition was almost rustic, but in the best way possible. I could imagine myself eating this dish in some small village in Thailand. The goose was also amazing. Not only is it rare that I get to eat goose meat, but it was cooked very well and included a good amount of chunk, breast meat. The fat was cooked off, which just left the tender, moist meat. 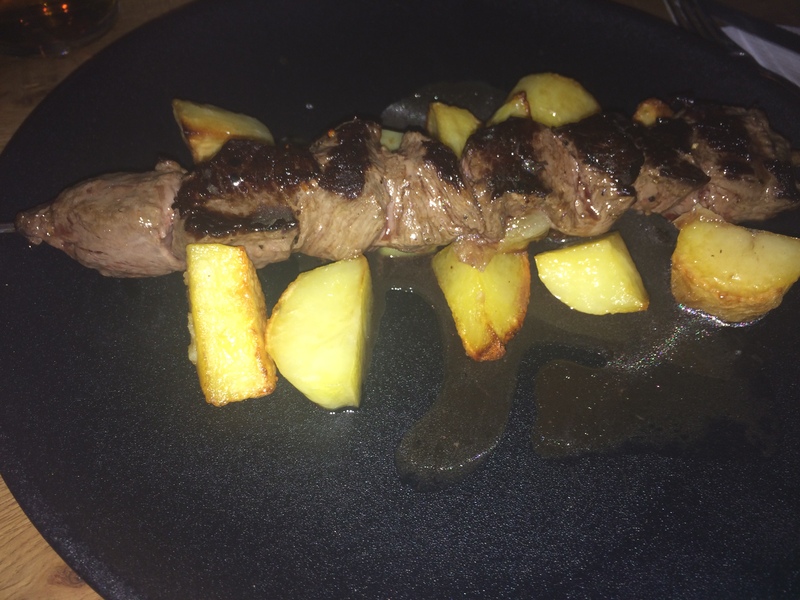 It was slightly gamier than duck, and very meaty—satisfied the carnivore in me. My experience at Thai House was in one word: delectable. The food was delicious and thoughtfully composed, the decor was authentic and at the same time the perfect level of campiness, and the location was wonderful. It was a great break from the hustle and bustle of my time in Tel Aviv and a satisfied my need for a spicy Thai meal. #Nomnom! I recently returned from a visit to Israel. The trip was amazing and we did so many great activities – rafting in the Galilee River, riding ATV’s in Golan Heights near the Syrian border, partying and relaxing on the beach in Tel Aviv and much more. However, my favorite part of the trip was the delicious food that we had. Everyday there was a big spread at breakfast of salads, breads, fish, cheeses, yogurts, bourekas, and juice. The large Israeli breakfast is well-known and filled me up for lots of activities throughout the day. Yet it wasn’t just the breakfast that filled me up. 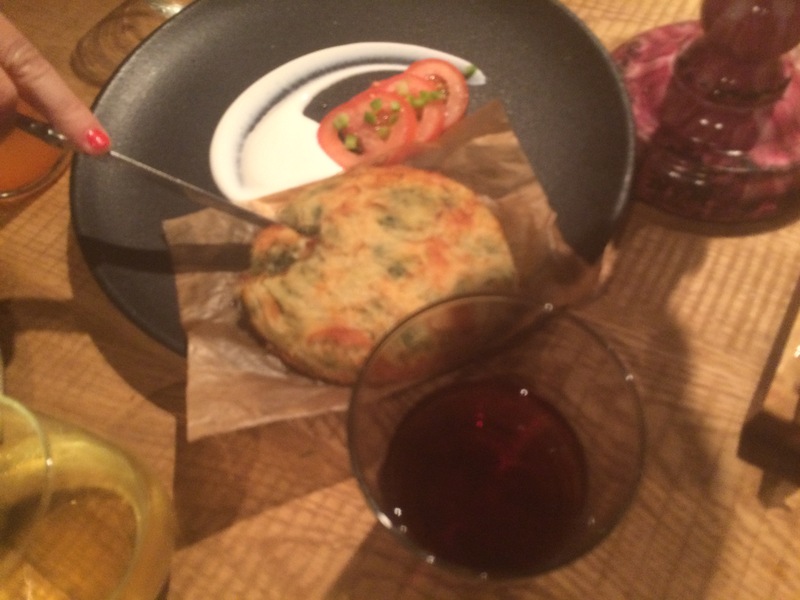 Israel has become hotspot for a growing food scene. Nowhere is the growing culinary movement more prevalent than in Tel Aviv—the cultural capital of Israel. 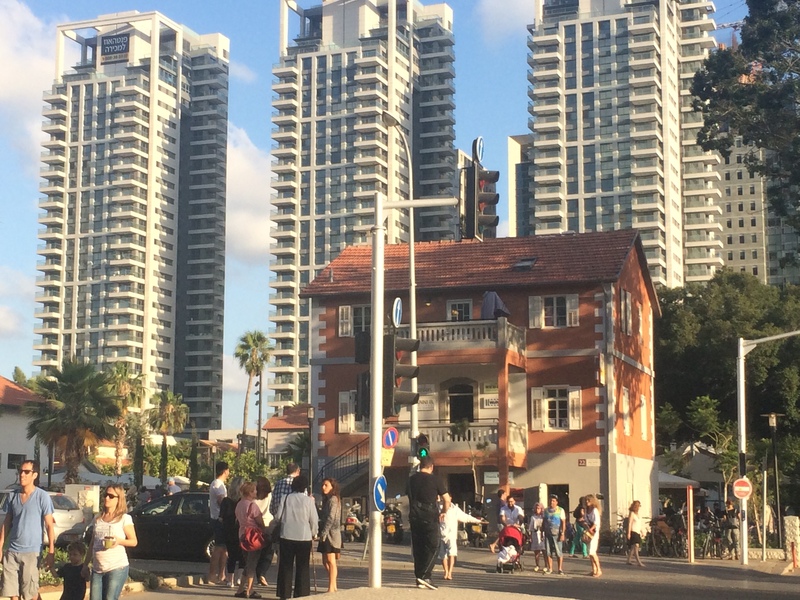 Tel Aviv is part beach town, but also had a big downtown area that is reminiscent of San Francisco. 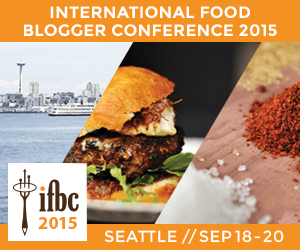 Plenty of young chefs come there to cut their teeth and open some amazing restaurants. 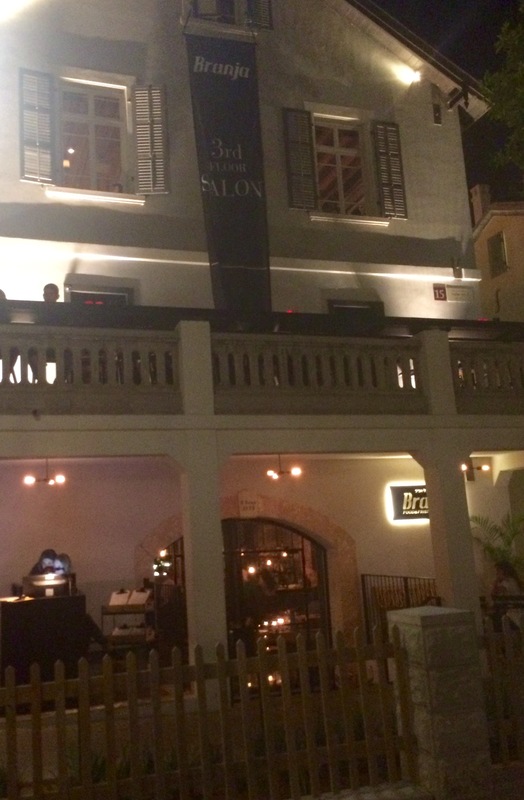 One such restaurant that I had the pleasure of dining in was Branja, in Tel Aviv’s super trendy Sarona complex—a blend of historic Tel Aviv architecture, modern urban green space, and a mix of stores, cute cafes, and hip restaurants right in the middle of the city. 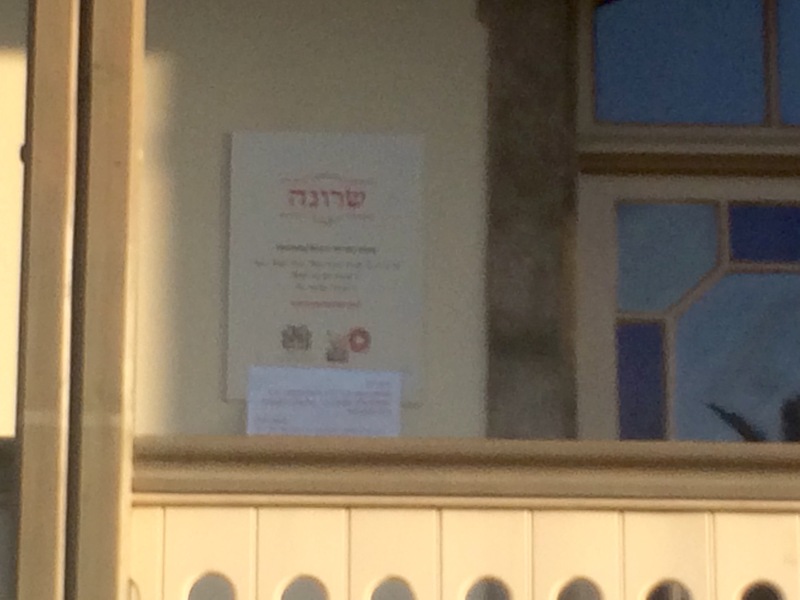 Even better, many of the restaurants, bars and cafes are open on Shabbat (Friday night/Saturday day). Branja is a Spanish-Mediterranean inspired restaurant, housed in a two-story Templar building that allows for a vibrant first floor restaurant, and a night bar and private dining space on the second floor. Since I was part of a big group, we had rented out the upstairs area, which was a treat—especially the wonderful terrace. We started the night off with a wonderful happy hour—waiters offered flutes of effervescent champagne, glasses of spicy red wine, and mugs of crisp, cold beer. There was a cute lounge bar in the salon with drink refills and they were very accommodating for our large group size. 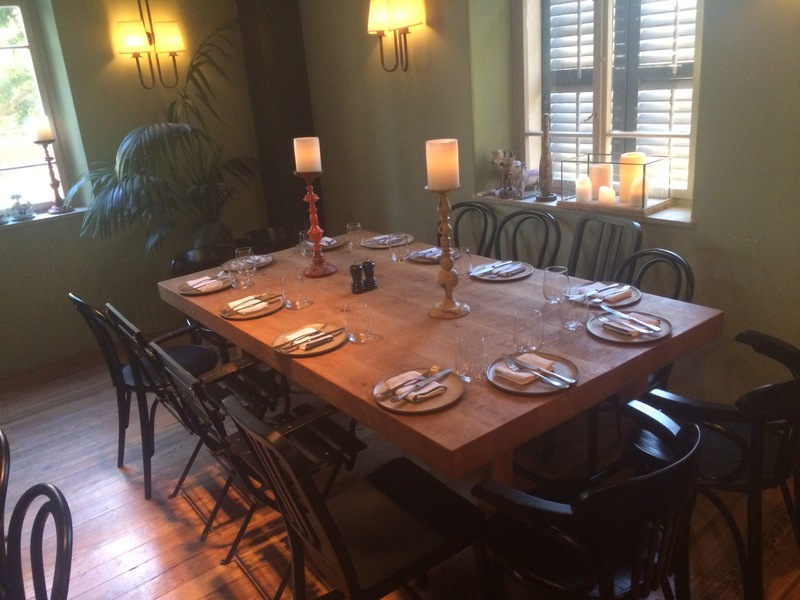 The dining room had a very rustic chic feel to it, with large, rectangular wooden tables set simply with ceramic plates and glass cups. 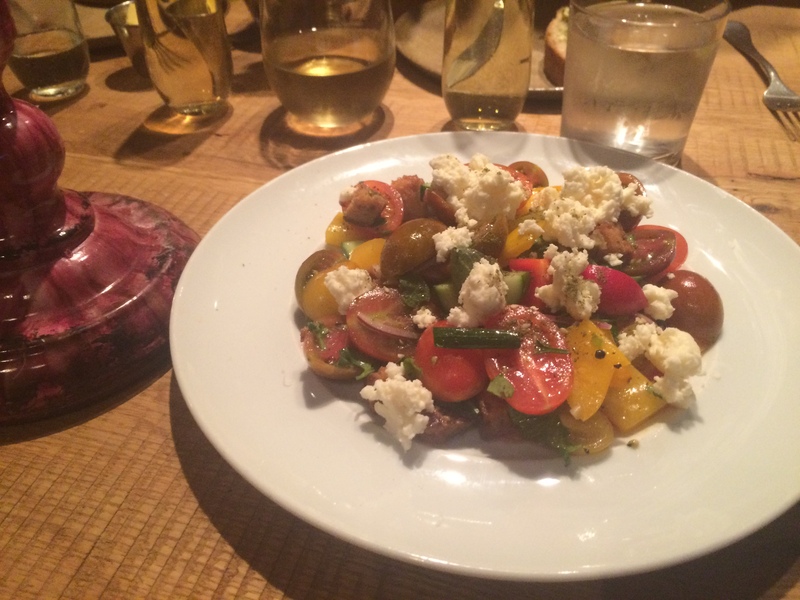 Our meal began with a simple salad of peppers, tomatoes, feta cheese, and cucumber in a light dressing made with fruity olive oil. Not only was the salad fresh and light, but also so pretty to look at with bold colors. There were also big baskets of freshly baked bread—white or wheat—served with creamy butter and house made schug, a traditional, spicy Israeli condiment made from hot peppers. The mix of the slightly sweet yet salty butter and the spicy schug spread on the bread made for a wonderful pop of flavors in my mouth. 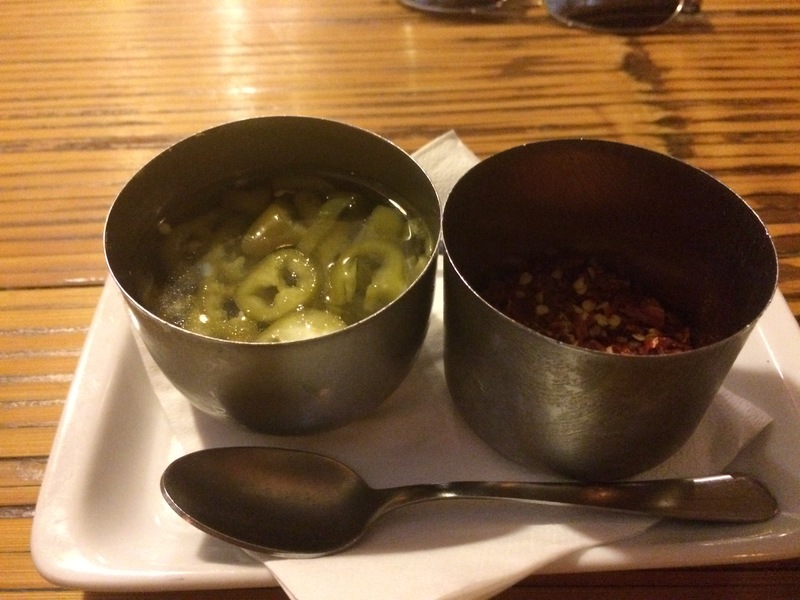 It was complemented nicely by some briny olives. 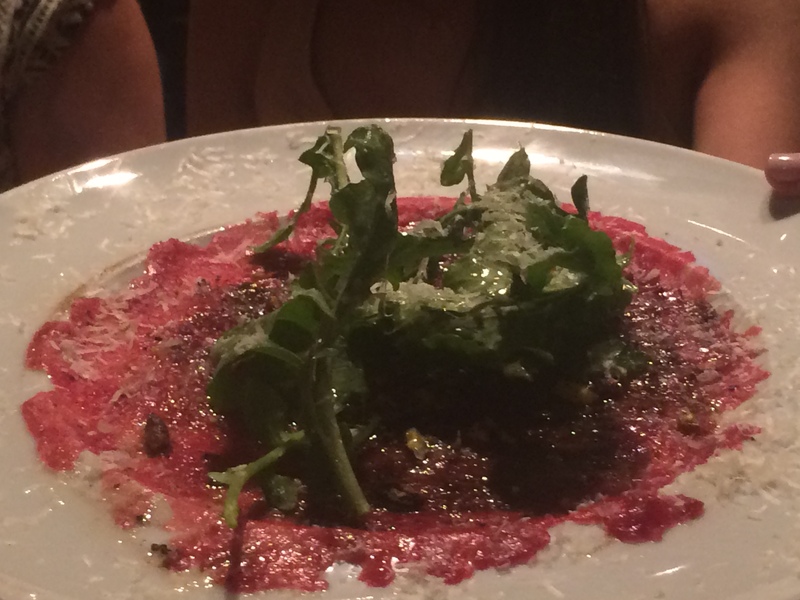 Next up was a plate of thinly sliced Sirloin Carpaccio. The beef was flavored with aged balsamic vinegar and pistachio to give it a nice punch of acidity, as well as an earthy flavor, and garnished with some peppery arugula that helped balance the richness of the meat. 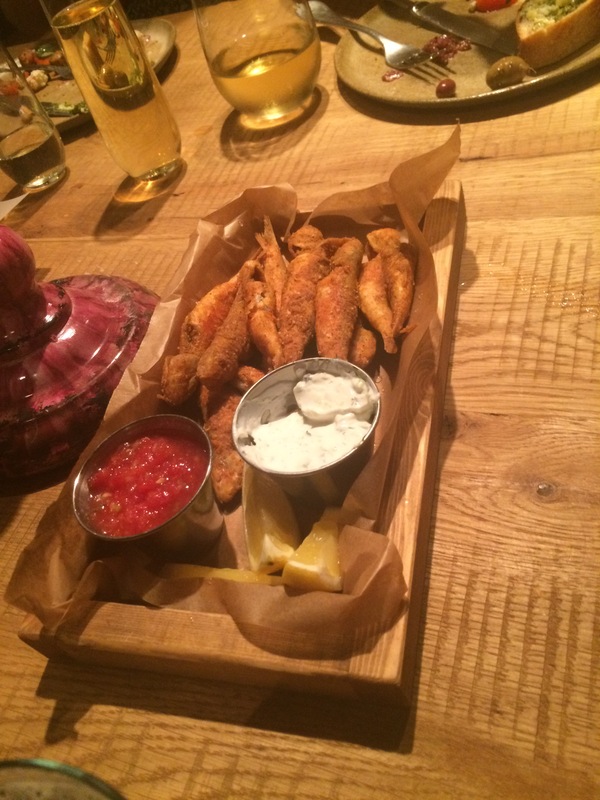 To follow, we had some fried red mullet with a crispy coating, served with a Tzatziki and a tomato salsa reminiscent of a cocktail sauce. The fish was moist, and the bones were so small that you were able to bite right through them and eat the fish whole if you like. A plate with a large potato and cheese pancake arrived as well, which was tasty but didn’t strike me as super Mediterranean in nature. My favorite appetizer of the night were the lamb pierogies. 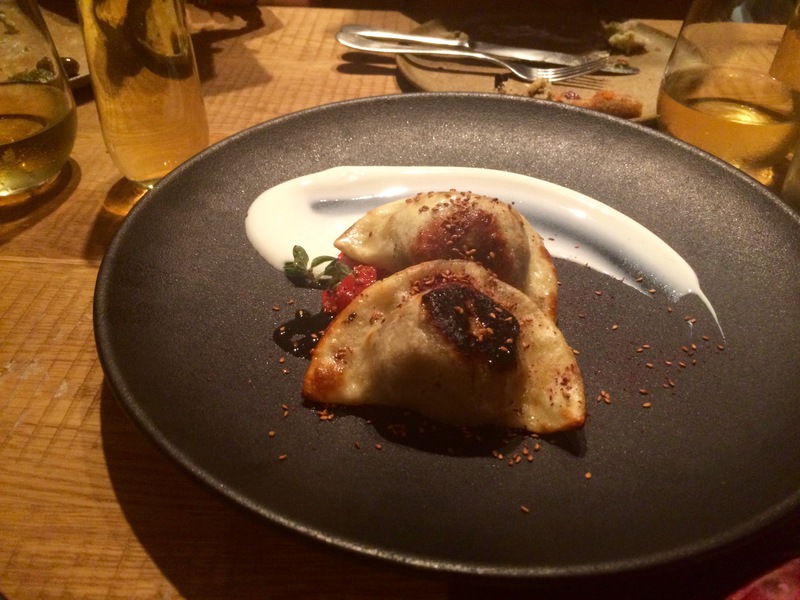 The pierogi were pan-fried with a nice crust and a savory, slightly smoky lamb filling. They were garnished with a pan sauce and plated on a black plate which made them look even more enticing. We had finally arrived at the main course, and had a choice of gnocchi, chicken or ram–which many of us assumed was lamb at first. 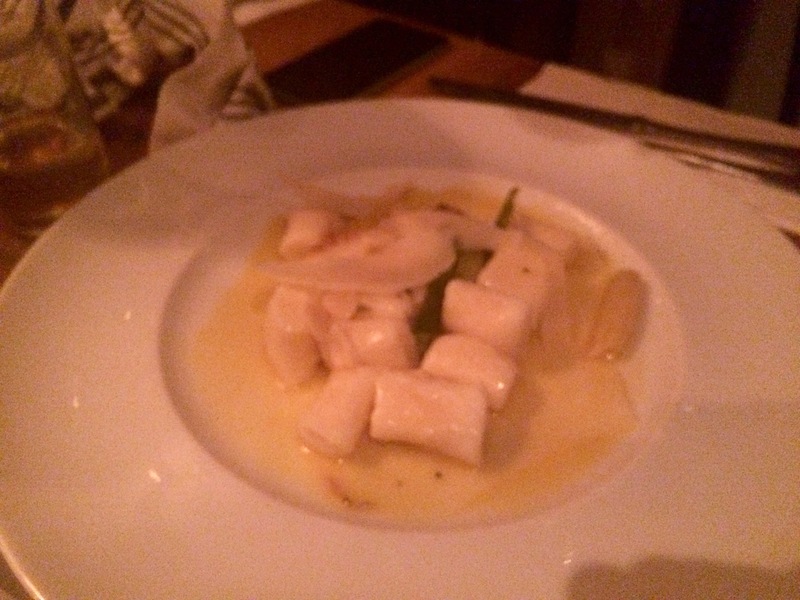 The gnocchi was served in a white butter sauce that was mild in flavor, but was nicely garnished with long pieces of Parmesan. The mini-dumplings were cooked al dente as to maintain a good bite without being mushy. They were also tossed with some asparagus that really woke the flavors up and helped cut through the richness of the sauce. My only complaint would be that I wish the potato in the gnocchi was incorporated a bit more. 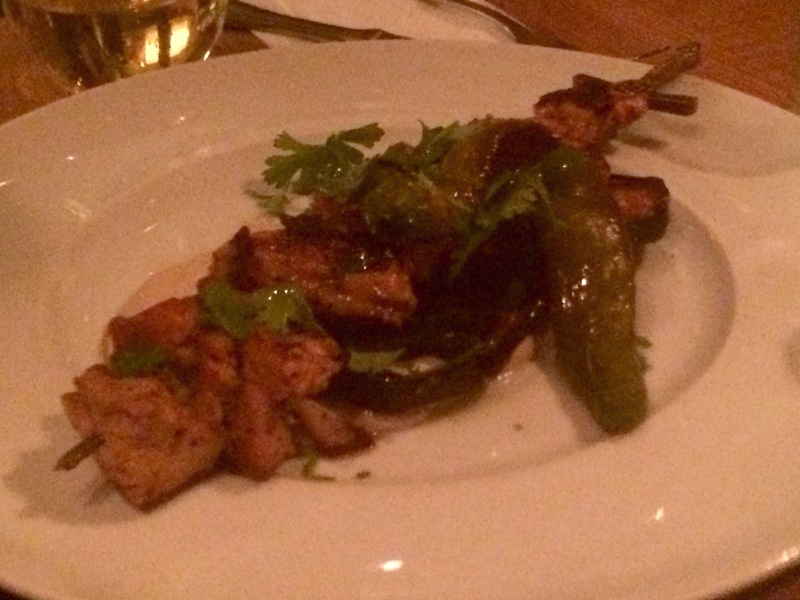 The second option available was for a chicken kabob, which was marinated in Middle Eastern spices, including cumin, garlic, za’atar, and harissa. The chicken was skewered and cooked perfectly. It was moist, and the chicken had a spice crust that helped seal the juices in the meat. 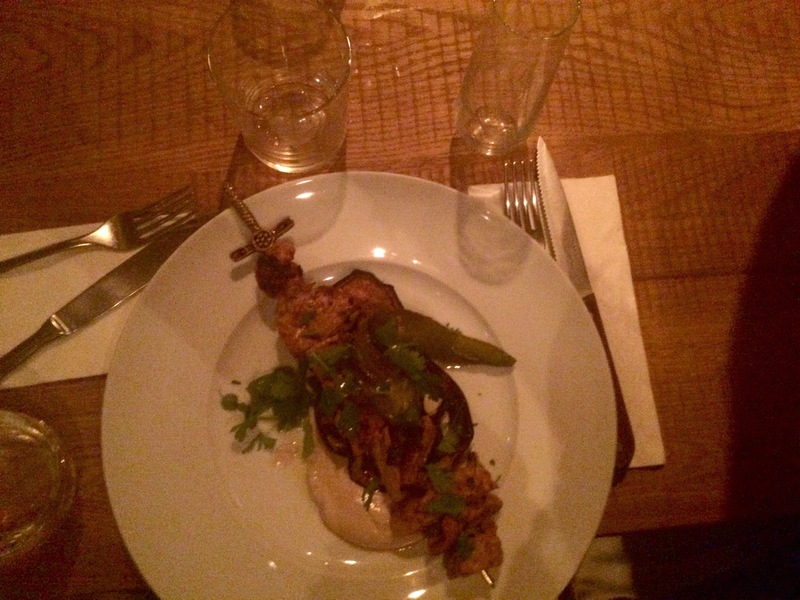 It was plated with roasted eggplant and tahini. A popular cooking method for eggplants in Israel is to cut the vegetable in half lengthwise, then roast it until the flesh becomes super creamy and delicious. This eggplant was dressed with tahini sauce–made from sesame–and was a nice contrast in flavor to the bold poultry meat. The final choice of entrees was ram steak on a stick. This was actually my first time eating ram, and, although we had to wait a little extra time for it to be prepared, it was very tasty! The meat wasn’t too chewy and had wonderful grill marks and was cooked somewhere between medium-rare and medium. It was plated with spicy, peppers, a generous amount of roasted potatoes, and demiglace. After our large meal we, of course, needed a delectable dessert, and Branja did not disappoint. We were presented with a trio of desserts. The creamy, mini cheesecake almost had a key lime pie flavor. 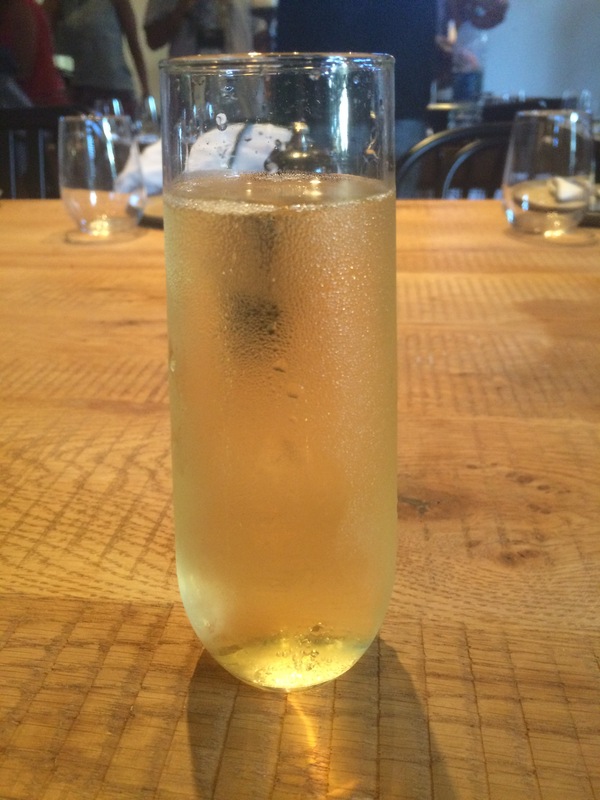 It was not too tangy or sweet, and absolutely refreshing–especially following such a heavy meal. The lime crumbs on top were a nice touch. 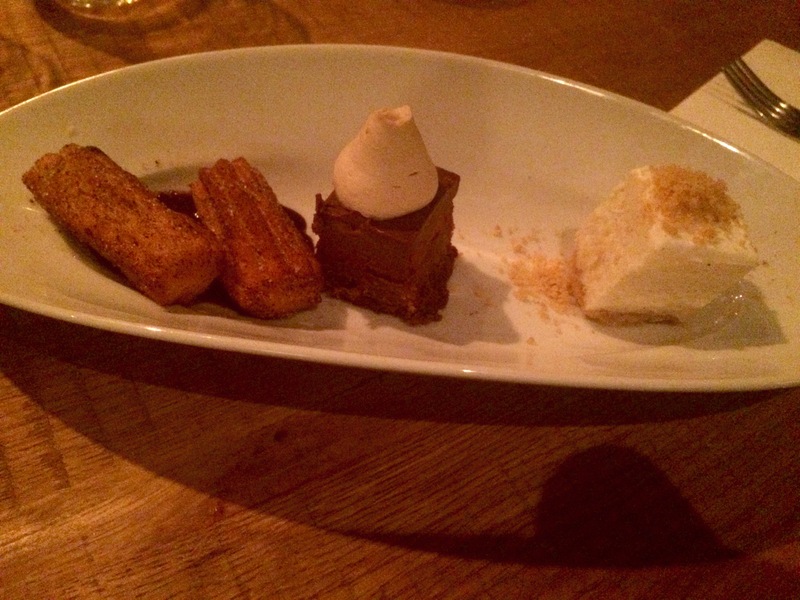 The plate also included some wonderful churros that were crisp on the outside and fluffy in the middle. They emitted an amazing cinnamon aroma and were served with a bittersweet, dark chocolate dipping sauce. The final pastry of the trip was a dense chocolate cake square with nougat. The cake was intensely chocolatey, but not super sweet. It was delicious, but my favorite part was actually the house made whip cream.